First impressions matter and few first impressions are more important than the one you make at an interview. Ready to score that dream job? Make more money? Advance in your career? Yeah, you are. To do it, you need to master interview etiquette. As humans, we gather our first impression of others in 27 seconds. Seriously, even in a blink of an eye, before the other person speaks. Your interviewer will do the same. That's why knowing exactly how to prepare with essential interview etiquette is the key to success. So how do you possibly impress professional and experienced managers, CFOs, CEOs, and all around bosses when you have seconds to make a great impression? No, not great, because honestly great won't do. But an outstanding impression? It's all about the interview etiquette that lets you shine from the moment your interview starts to the moment you get hired. We're not talking about the manners your mom probably still nags you about. Interview etiquette is more than saying please and thank you, keeping your elbows off the table, or not smacking your gum. But just so we're clear - definitely use your please and thank you's, keep your elbows off that table, and don't even think about chewing gum. Instead, opt for a pre-interview mint that's finished before you enter the room. Basically, job interview etiquette is a code of conduct that must (yes, must) be followed to excel at an interview and land the job. There is so much involved in interview etiquette. It encompasses the more basic factors like what to wear, all the way up to the easy to overlook but essential details like what you do while you sit in the waiting room. ​If you think you can just show up to an interview and nail it without the right etiquette, then you definitely need some interview etiquette. But don't worry, you're not alone, everyone needs interview etiquette. From preparing for your first interview ever to a seasoned professional ready to interview for an advanced position, and everything in between, etiquette matters. You might think your skills will be enough and you can shrug off etiquette, but unfortunately, that's just not how it goes. Sorry, we wish it was that easy too. The truth is you won't be the only one interviewed. And everyone who gets chosen for an interview will have the skills; that's the whole point of a resume. Interview etiquette is how you stand out against your skilled competition. It's what has you walking into the building with confidence, shaking hands like a pro, and leaving everyone you interact with wanting you as part of their team. You know you're great, we know you're great, but without interview etiquette, it might be hard for your potential employer to see. You probably guessed that interview etiquette is a big deal during the interview, but it actually starts way before you show up to that big moment. Crushing an interview breaks down into three time blocks, before the interview, during the interview, and after the interview. Yeah, we know...it would be nice if an interview was over when it was over, but there's still a little work to put in after, but it's so worth it. ​Okay, now that we've covered the basics of interview etiquette, let's dive into the actionable steps you should take before, during and after the interview process. You've got this! Possibly the very first thing you should do when you land an interview is research. Surveys show that 88% of hiring managers think an "informed candidate is a qualified candidate." ​The hiring team wants to know your interest in their company is for more than a paycheck, and you can't be interested in something if you don't know about it. ​Knowing as much as you can about a company will make answering interview questions easier. ​The more you know, the more confidence you have, and confidence is key. Researching a company will help you understand their story, values, and culture. Let's focus on number four for a second. Not only do hiring managers want to hire someone with the skills for the job, but they want someone who also matches a company or brands values and culture. A millennial marketing study even found that 43% of HR professionals found that a cultural fit is the most important quality they seek in potential hires. If all you have time to do is check out the company's website, then that's still better than nothing. But we want you to do better than just okay, so troll the company's social media, their blogs, their reviews, anything you can find. Don't worry; no one will know that you went into stalker mode. As you research, take note of any big ventures the company has recently taken on, noteworthy accomplishments, recent awards, publications, news and media spotlights, and key players. If you really want to take it to the next level, try to find out some information about your interviewer too. Knowing some information about your interviewer before you show up will make you feel less lost in the dark, so you'll appear more confident and put together. ​Practice doesn't make perfect. Only perfect practice makes perfect. Practice doesn't guarantee that your interview will go perfectly, but it will make a world of difference. Think about it, is there anything you'd want to do for the first time in front of a person or multiple people who are there to judge you? Yeah, we don't think so. But wait, how do you practice for an interview? You can tackle this step solo or with a friend. Practicing for an interview is practicing and rehearsing answers to common interview questions. Every interview will be as unique as you, but there are still some common themes. One almost guarantee is that you'll be asked to share your work experience and what makes you different. Practicing answers to common questions whether it's out loud to yourself or a friend, will make it so you never feel thrown off on the spot. And practicing for your interview doesn't just mean practicing answers, but questions too. That's right; the person interviewing you shouldn't be the only one asking questions. At almost every interview you'll be asked if you have any questions, and while you might think saying “no” makes you appear if you understood everything, the reality is that you'll probably just appeared disengaged. Keep in mind that the person interviewing you probably doesn't want to hear you asking about the day to day of a job or other basic questions, they want to hire an expert, so ask expert questions (but not too many). Most people will tell you to dress to impress, and while it's always better to dress up than down, dressing for the job you want is more important. Whether you should wear a dress and heels or a suit and dress shoes or slacks and a nice shirt largely depend on the job you're interviewing for. 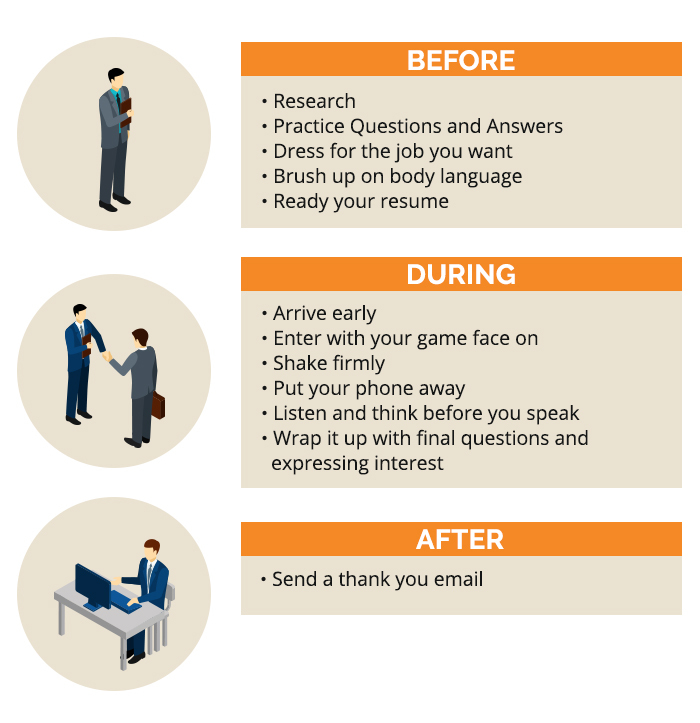 While your interview outfit will vary depending on the position you want, make sure to follow these common do's and don'ts. ​If you really don't know how to dress for a specific interview, don't be afraid to ask. It's way better to ask ahead of time than show up to the interview second guessing yourself. And, chances are by doing some job board searching you can find advice from other employees too. When considering interview etiquette, most people practice what they will say, but what about what your body says? Body language is a huge component of crushing an interview, and the way you move while you talk or while you listen can have a significant impact on the person who is interviewing you and on the impression you leave. You don't need to bring much to an interview, and you definitely don't want to walk in with the rest of your morning coffee, but you do need some essentials. But first a quick note on not carrying your morning coffee into the interview building. This probably seems like a weird tip, but do you really want one of your first interactions with the receptionist or hiring manager to be you asking for the trash? (No, you don't). You do want to make sure you pack crisp extra copies of your resume, which would be best stored in a folder. And while you don't want to hand in a colored or scented resume, adding a small and subtle touch of creativity can make your resume stand out. And having a pen and notepad to jot down any important details helps you look professional and prepared too, plus there will be details you'll want to write down. Just make sure to not only have your resume ready but to have it easily accessible. Whether you're asked for it or take the initiative to offer it yourself, nothing will slow your roll more than digging through a purse or briefcase of chaos. Everyone knows it's good interview etiquette to shoe up early, but how early is too early and what's just right? 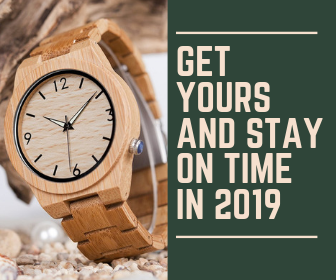 ​If you're early, you're on time. If you're on time, you're late. Showing up 10 to 15 minutes early to an interview is standard, but you don't want to show up much earlier than that. Showing up way too early (like 30 minutes early) might show that you're anxious. Showing up 10 to 15 minutes before your interview has a bunch of perks, starting with ensuring that you aren't late. By showing up early you also have time for a quick bathroom run, to complete any pre-interview paperwork, and to take in the office settings and see how the staff interacts and if everyone seems happy. It's best to plan ahead and leave enough time to commute so you still arrive early with traffic. And if you do arrive over 15 minutes early, try to relax in your car by listening to music or meditating. And if you didn't drive, take a short and slow walk before entering the building. Remember, there are few things worse than showing up late to an interview, but if you are running late for whatever reason, your best bet is to call in and let the office or your interviewer know, so they aren't just waiting around clueless. When it's time for the interview, put your game face on before you enter the office or building and be ready to impress anyone at any moment. The person at the front desk or anyone working at the office might not be the hiring manager, but they might very well have a say, regardless of how small in whether you're hired. Often the hiring team will ask other staff and especially their receptionists how a potential hire made an entrance, and this is often considered in the ultimate hiring decision. After all, a company and its hiring team will want not only someone with the skills to do the job but someone who will fit in with the company's culture. To make sure everyone has good things to say about you, walk in standing tall, confident and with a smile on your face. Don't forget to say hi, acknowledge others, and be nice. Is there anyone left who doesn't pull their phone out when it's time to wait? Even if that wait is one short minute? Probably not, but an interview is your time to be that person. Instead of pulling out your phone when you get to the lobby or waiting room and wait for the person who will interview you, opt for reviewing your resume, cover letter, or maybe even this article for some last minute tips. When you keep your phone away, you won't be thrown off guard when your potential new boss walks into the room by being deep into an Instagram stalk or a heated game. Even better, you won't accidentally play someone's story or a video on full blast. And it's best to turn your phone off before you put it away. That might sound extreme, especially since you can put your phone on vibrate or silent, but it's the best option. Even if you leave your phone on vibrate tucked away in your purse, briefcase, or pocket a random vibrate during the interview can completely throw you off. And if it doesn't throw you off, it might be a nuisance to the person who is interviewing you. Rumor has it that a Fortune 500 CEO once said when he had to choose between two candidates with the same qualifications, he went with the candidate with the better handshake. Sound extreme? Yeah, maybe, but it also sounds like you should get working on that handshake. ​Also, at an interview, you will probably expect the person hiring you to make the first move, but that doesn't always have to be the case. If the opportunity naturally presents itself for you to make the first move, go for it. 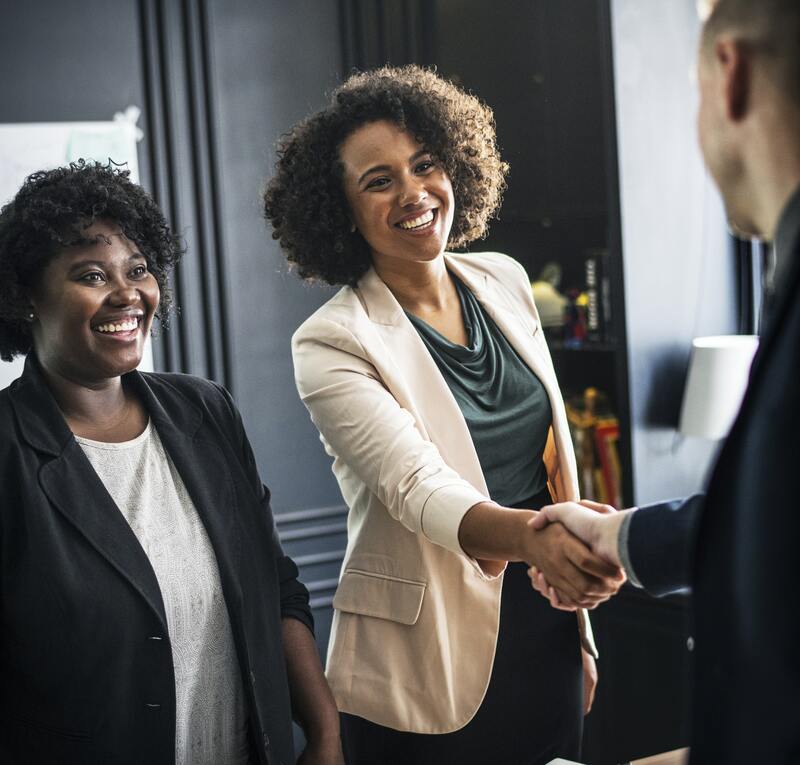 Being the one to go ahead and extend your hand and introduce yourself first will express confidence and that you're both excited about the position and ready for the interview. You should always give the person who is interviewing you your undivided attention, but this is especially true when you're being asked a question. Listen to the entire question carefully to make sure you understand it. And always, always, always wait until the interviewer is finished speaking before you start. And after you're done listening, take a moment to think. You know those moments where your mouth moves and before your brain has a chance to intervene a bunch of word vomit just comes right out? Yeah…an interview is no place for that. While you don't want to ponder into space while scratching your chin for an extended period of time, a quick moment to gather your thoughts and deliver with a concise answer is perfectly fine. ​If the person interviewing you offers a glass of water, take it, even if you're not thirsty. In moments where you need to think, you can take a sip of water to buy you some time. Just make sure to keep it natural and not do this excessively. As the interview comes to a close, ask what the next steps in the interview process will be and when you should expect to hear back. Try not to be too overbearing as you don't want the interviewer to feel any pressure or discomfort, but you also don't want to leave the interview feeling like you're in the dark. This is also a good time to express interest in the position. If after the interview you're still interested, there's no point in not admitting to it, why confuse the interviewer or give them any reason not to pick you? Let the interviewer know that you're excited about the company and look forward to an opportunity to move forward. Just remember not to come on too strong. As we mentioned before, interview etiquette doesn't end when the interview does. There's one more big step to take after the interview is over. On the very same day of your interview, make sure to send a proper thank you email to everyone who interviewed you. Reach out, and thank the interviewers for their time and reiterate a highlight of your skills, a personal detail, a mutual connection, or a good topic covered during the interview. This way not only will the interviewer know you appreciated their time, but it'll better help them remember your outstanding job at the interview. Now, remember, you want to express thanks but don't overdo it. There's no need to send your interviewer gifts, flowers, or anything elaborate. Interviews can be overwhelming and nerve-racking processes, but now they don't have to be, at least not for you. With the information on interview etiquette that we've just covered, you're ready to crush any interview. Whatever that next big career step is, you've got this!